Now that Mayor Jackson has taken office it’s squarely on his shoulders to not just talk but to show results in improving Trenton. We all have emotional responses to the situation we’re in and it’s difficult to put our finger on what bothers us most. If we really think about it though there are five key indicators of Trenton’s health. Five symptoms that show how well we’re doing. And if all five of these indicators started showing signs of improvement, all Trentonians would notice the city coming back to life. If we could see progress in these five areas we’d have hope again that would be contagious. To be a successful Mayor, Eric Jackson must lead Trenton to show progress on these 5 measures. It’s not nearly enough to say “I’m working hard”. Mayors have said that before and the problem was they were working on the wrong things. Doing the smart thing is much more important than working hard on the wrong thing. Over the next several years I plan to do my part by reporting to Trentonians on Mr. Jackson’s progress on these basic measures. I’m looking for results not promises of results. The following is my initial report. The most important measure is the simplest one, is Trenton such an attractive place to live that our population is growing. Unfortunately the current answer is NO. Relative to our neighbors, Trenton has become a less desirable place to live. Over the past 44 years Trenton has steadily under-performed with the State growing 43% faster than Trenton. 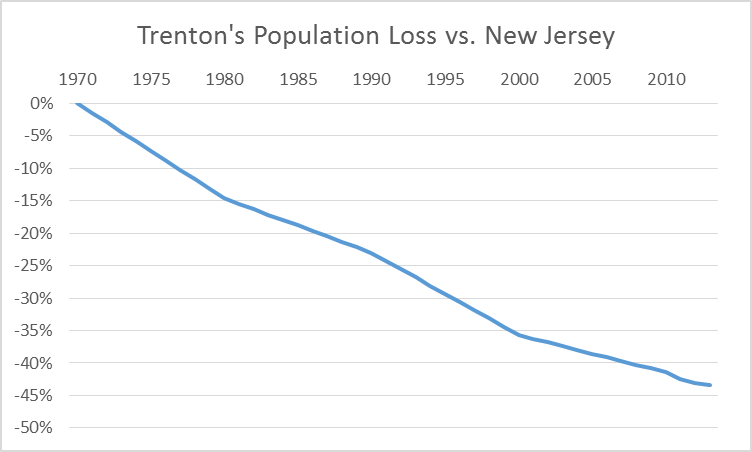 While New Jersey’s growth has accelerated Trenton’s population has shrunk. We benefit from the same factors that drive growth in the state so it is especially disappointing that Trenton continues to lose people. Some have pointed out that Trenton’s population loss has slowed, but that is blatantly misleading. It has only slowed because New Jersey’s growth has accelerated. In 2011 Trenton’s tax base, the value of property on which we can charge a property tax, was $2,009,731,470. By 2014 it has declined to $1,993,783,800. This represents a .8% loss in ratables for the city. The implications of this statistic are large. It means our economy is getting worse instead of better and most importantly, it means that our policies are not working. We can never have a lower tax rate or afford to spend more money on parks, police and streets unless our ratables go up. This is in stark contrast to NJ’s median household income of $71,637, which is almost double that of Trenton’s. Making Trenton attractive to retail and entertainment business is important as the presence of those amenities makes the city attractive to new residents and businesses but we won’t get new amenities without more spending power in the city. The Trenton school district’s 2013 graduation rate was 48.6%. The cumulative effect of moving the graduation rate up to 75% could halve our crime problem in the long run if the correlations between dropout rate and crime follows. Trenton’s crime problems have tracked the national trend downwards over the last decade. However in 2013, Trenton set a murder record of 37 which placed it among the most dangerous cities in America. Meanwhile neighboring Hamilton had a crime index 2057 and only 1 murder in 2013. These conclusions alone are quite damning for Trenton. However, it gets worse. If a city becomes depopulated, the crime rate goes up because the criminals stay behind. Also, because high income people leave, poverty becomes more concentrated. 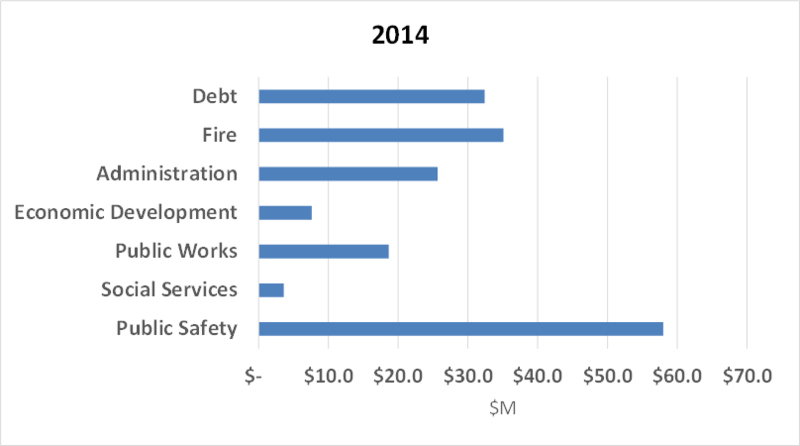 Debt, fire and police make up almost all of the budget and other functions are cut to the bone. 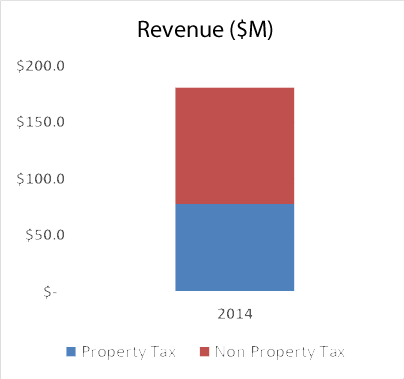 Property tax makes up less than half of our budget so any change in the budget will have a large effect on taxes. How can we turn this city around? How can we turn a vicious cycle into a virtuous circle?